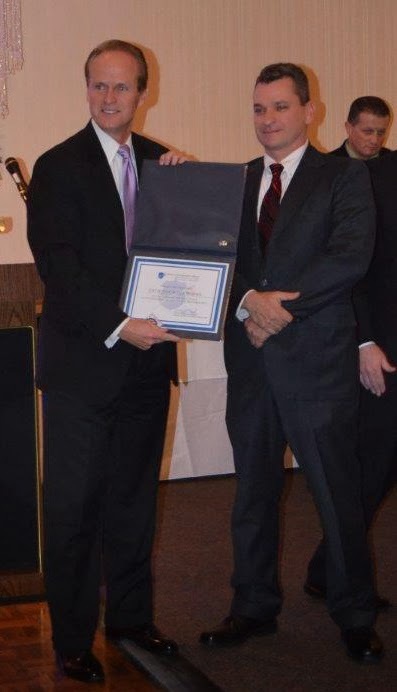 On Tuesday, December 17, Memorial Fund Chairman & CEO Craig W. Floyd presented Detective Scott Wisner with the Officer of the Month Award for December 2013 during Sandy Hook Appreciation Night, an event hosted by the Connecticut State Police Union that honored officers who responded to the Sandy Hook school shooting in December 2012. Detective Wisner was selected as December's Officer of the Month due to his heroic actions during the pursuit of robbery suspects in April of 2013. Mr. Floyd gave a brief presentation about the Memorial Fund and the Officer of the Month Award Program, and then presented Detective Wisner with his Officer of the Month Award. In presenting this month's award, Mr. Floyd stated "As long as there are people like Detective Wisner among us who are willing to risk their lives for the safety and protection of others, there is indeed great hope for the future of our children and for the future of our nation." Detective Wisner, along with the other Officer of the Month Award winners for 2013, will be honored at a special awards luncheon in Washington, DC, in May 2014, during National Police Week. In addition, their stories of heroism and service will be featured in the Memorial Fund’s annual calendar. Atlanta Falcons owner Arthur Blank presenting Cpl. Young's family with the game ball during the tribute. This past Sunday, December 15, Memorial Fund Chairman & CEO Craig W. Floyd joined Atlanta Falcons owner Arthur Blank on the field before their game versus the Washington Redskins. Accompanied by Georgia governor Nathan Deal and Commissioner of the Georgia Department of Public Safety Mark McDonough, they presented Corporal Young's family with a special Recorded Memorial Tribute in honor of their loved one, Georgia Department of Public Safety officer and 7-time trooper of the year, Corporal Michael Young, who was killed in an auto crash during a vehicle pursuit in 2006. Launched in the summer of 2012, the Recorded Memorial Tribute Program is designed to share the stories of law enforcement officers who have died in the line of duty. The program provides a special way for all citizens to honor those who have made the ultimate sacrifice. You can view Corporal Young's Recorded Memorial Tribute on the Memorial Fund's website. Special thanks to Bob McDonough, Chief Security Officer of the Atlanta Falcons, and Bill McClain, retired Secret Service Agent and Chief Security Officer for Home Depot, Inc. for coordinating this presentation, and to the Atlanta Falcons for sponsoring the creation of Corporal Young's Recorded Memorial Tribute. This is the second year in a row that the Falcons have honored a fallen Georgia officer prior to a game. The Memorial Fund would like to take this opportunity to extend our sincere gratitude to our friends at the Police Unity Tour for their continued partnership with our organization. This year's event during National Police Week marked 17 years of working together to honor fallen law enforcement officers. During those 17 years, the Police Unity Tour has donated nearly 14 million dollars to the Memorial Fund. They are the generous sponsor of our Officer of the Month Award Program and participate in various other events that the Memorial hosts during the year. Memorial Fund Chairman & CEO Craig Floyd. Thank you again to the Police Unity Tour and we look forward to continuing our successful partnership for years to come! Do you have a tough time shopping for that special officer in your life? Look no further than the National Law Enforcement Officers Memorial Gift Shop to find something for everyone on your list. 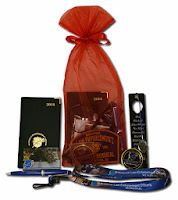 You can find these gifts and more in our online store. A great selection of small gifts for a low price, our Organdy drawstring bag includes some of our most popular items. This bag includes the following: Adult Awareness Band, 2013 Challenge Coin, 2014 Datebook, Disposable Pen, Metal Lion Bookmark, Layered Magnet, Dedication Patch, Lanyard, and an Eyeglass Cleaning Cloth. For that officer who is always on the go, the modern slim styling of this tote bag conceals a generous main compartment. The front zippered pocket and earbud port will make it a breeze to keep cell phones, keys, and music handy. Buying for a movie buff? Produced by Modern City Entertainment, Heroes Behind The Badge features stories of some of the brave men and women of law enforcement who have put their lives on the line and survived, as well as those who have made the ultimate sacrifice. Your family can experience the power and emotion of this 25th annual tribute to America’s fallen law enforcement officers. This year's ceremony includes moving musical tributes, a stunning blue laser light show, keynote address by Attorney General Eric Holder, and the reading of the 321 newly-engraved names on the Memorial. For the coin enthusiast on your list, this beautiful bronze 1 3/4 inch coin with a hand rubbed antique finish features the inspiring quote, "It Is Not How These Officers Died That Made Them Heroes, It Is How They Lived." And don't forget to grab this year's Memorial Challenge Coin, which reminds us that "Heroes Live Forever". For a new father or mother, this incredibly soft infant onesie is made in the USA by American Apparel. It's available in Navy, Pink, Red, and Light Blue, and in sizes 3-6 months, 6-12 months, 12-18 months, and 18-24 months. 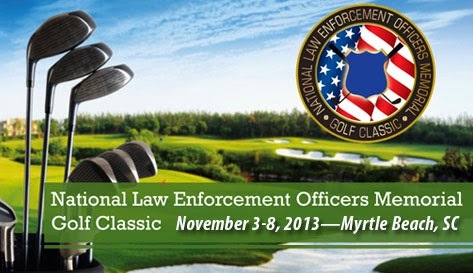 The 14th Annual National Law Enforcement Officers Memorial Golf Classic (NLEOMGC) was held November 3-7 in Myrtle Beach, SC. Considered the largest law enforcement golf tournament in the world, this year's event was attended by more than 600 golfers from the USA and Canada. 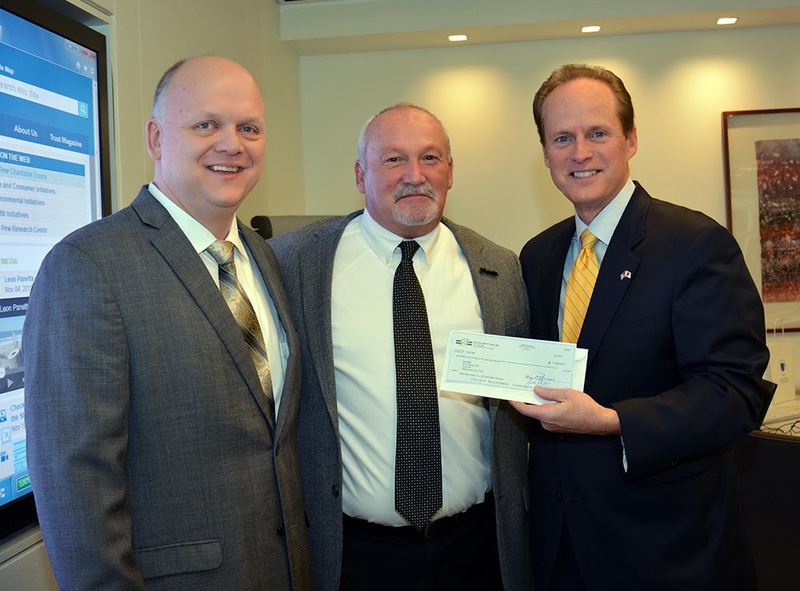 The NLEOMGC event raised over $23,000 for the National Law Enforcement Officers Memorial Fund and the National Law Enforcement Museum this year, bringing their total donations to $538,000. Women's Category: Vicki Dawson, Toronto (Canada) Police Department. NLEOMGC's organizer, Rochester (NY) Police Officer Dan Morphet (ret.) has already announced dates for the 15th annual tournament for November 2 - 7, 2014. The 2014 tournament will bring a new course to the lineup with the World Tour Golf Links being added to the five legends courses and Tidewater currently being played. Law enforcement groups interested in hosting their own local golf tournaments are encouraged to contact Dan Morphet at NLEOMGC@aol.com to find out how they can be a part of the annual event. For more information about the annual golf classic, visit www.nleomgc.com.